A few days before Theatre Conspiracy’s first Victim Impact workshop, Rashida Samji’s lawyers made a last-ditch appeal before a tribunal of Supreme Court justices in Vancouver. The trio of judges didn’t look especially convinced. For director Jiv Parasram, composer David Mesiha, dramaturg Kathleen Flaherty, outreach coordinator Gavan Cheema and myself, the day in court was a fine intro to a legal/ethical/moral rabbit hole into which the artistic team would dive into in the coming week. Sorting out fiction and reality within the stories of compulsive liars certainly generates fascinating, mysterious tangents. Samji faces six years in a federal pen for ripping off around 200 people locally in a $118 million Ponzi scheme in collaboration with her partner-in-fraud, Arvind Patel. He received (questionably, IMHO) a suspended sentence, 3 years probation, earlier this year. Victim Impact questions the degree to which we are all victims of (perhaps psychopathic) fraudsters who abuse community trust, facilitated by the (perhaps negligent) institutions trusted to ensure such fraud does not occur. Solving the problem is complicated by how communities – familial, religious, ethnic, cultural, corporate, public institutional – often demand silence to preserve status, adding to the stigma of loss for those most vulnerable within their communities. Silence isn’t unique to this case; it’s the average thing. And, metaphorically, silence is a carcinogen that encourages the next con to happen. What a gift for Conspiracy to draw a lot of talent to explore the mess and begin to shape a play out of it: performers Nimet Kanji, Munish Sharma, Allan Morgan, Risha Nanda and Jennifer Griffin; visuals designer Milton Lim, stage manager Heidi Quicke and communications manager Belinda Bruce. 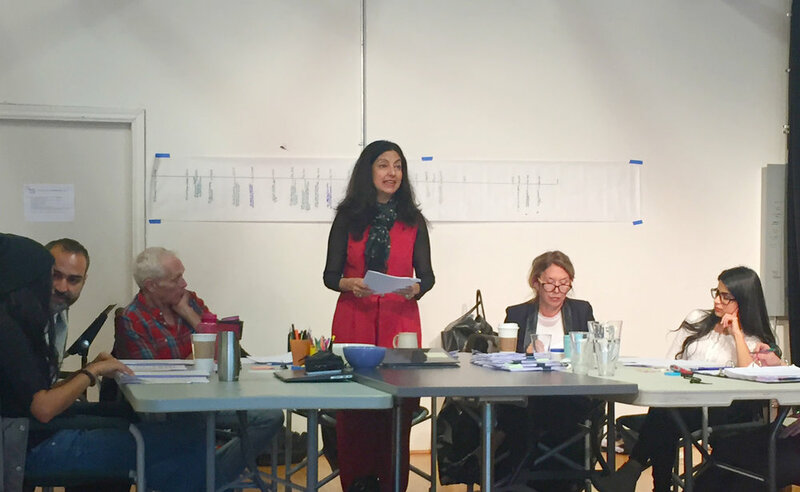 A special thanks – yet again – to Playwrights Theatre Centre for its development support and to funders including the Canada Council for the Arts, B.C. Arts Council, Vancouver Foundation and City of Vancouver Office of Cultural Affairs. 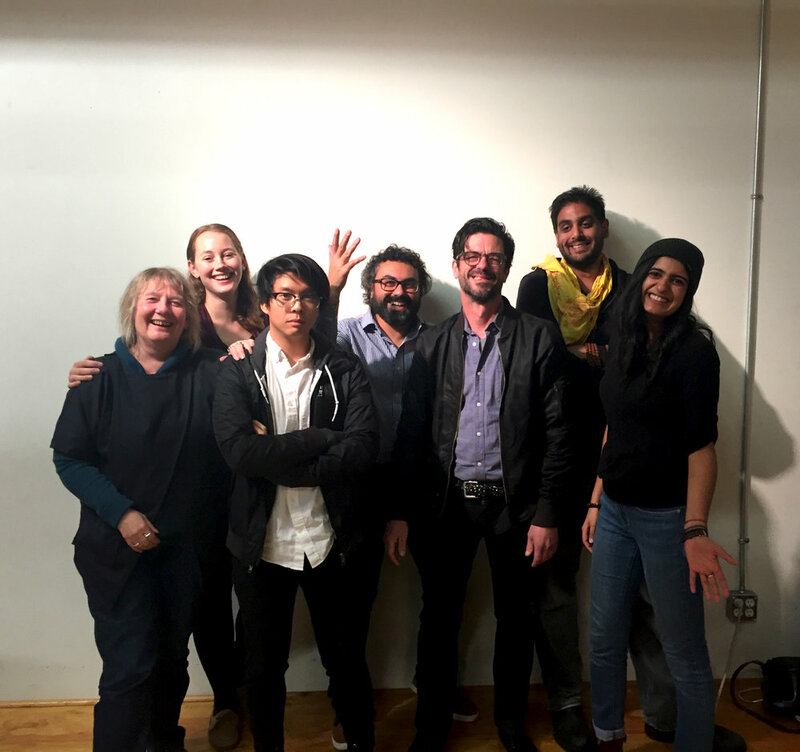 Victim Impact team, L to R: dramaturg Kathleen Flaherty, stage manager Heidi Quicke, visuals designer Milton Lim, sound composer David Mesiha, writer/producer Tim Carlson, director Jiv Parasam, outreach coordinator Gavan Cheema. Patrick Blenkarn on "Soliloquy in English"